In the last three days crowd-funders have pledged £445 – Thanks!!! Over the next few months, AMCE will be carrying out a new renewable energy study for the Moor, as part of Cumbria Action for Sustainability’s ‘Community Greenprint’ project. We’ll be working with TecLimited to identify how much energy is generated from renewables, and the potential for solar, small-scale wind and hydro across the Moor. We’ll also be undertaking more detailed studies on the potential for renewables at Samuel Kings’, Bonds Foundry and one other site, as well as a household survey to better understand how energy is currently used and the potential to improve it. The work is being funded from the remainder of a grant from the Postcode Lottery Trust, as well as the Esme Fairburn Foundation. All the outputs will be publicly available on the AMCE website at the end of the project in December, including the maps of energy potential. AMCE was formed following the work done by Alston Moor Partnership and Cumbria Action For Sustainability to progress the Nenthead Hydro project, but this is by no means the end! The learning gained from developing the project has been invaluable, and the Directors of are now looking at other low-carbon energy projects in the Alston Moor area. These may include solar PV installations. We are also open to suggestions from other groups or members of the public. Any scheme we consider has to meet our aims of community ownership, reducing greenhouse gas emissions, providing locally sourced renewable energy and of providing a financial return for the community. The Directors of AMCE have been working over the last few months to test the possibility of buying and redeveloping the hydro-power scheme at Nenthead. To do this, we successfully secured funding from both the UK Government, as well as the Postcode lottery, which has paid for the research to enable us make an informed decision about the project’s future. We have now, reluctantly, come to the conclusion that we should not go ahead with this. The project has proved to be hugely complicated, and one area in particularly, the transfer from Renewable Obligation Certificates to Feed-in Tariffs, has never been done before by other organisations and we have no certainty that Ofgem will permit it. Despite our best efforts, there remain a number of risks to the project. Some of these cannot be quantified completely, and others could only be resolved by considerable ‘up-front’ expense on civil engineering investigations. Despite receiving grants and loans to fund some of this research, the potential costs would have exceeded our budgets, and we are unwilling to commit substantial further funds on speculative investigations. The Directors feel that we could not ask members to buy shares in the project, given the level of risk. One of the main aims of the project was to produce a financial benefit to the community, and any major unexpected expense on the project could reduce this to zero. So, the wait is over, we’re officially launching on 2nd Dec at Garrigill Village Hall, in association with Alston Moor Film! We’ll be talking about our work on Nenthead Hydro, and our future plans, as well as how you can get involved. 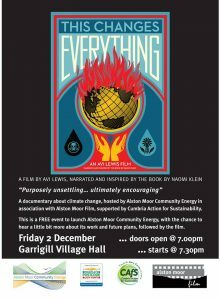 We’re then showing the documentary on climate change and capitalism ‘This Changes Everything’, based on the book by Naomi Klein. And the best thing? It’s FREE! That’s right, FREE!